SUNNYVALE, Calif., Sept. 26, 2011 -- Spansion Inc. (NYSE: CODE), today announced the industry's fastest serial Flash memory, the Spansion® FL-S NOR Flash memory family at 65nm. The product family has over 20% faster double data rate (DDR) read speeds and three times the programming speed over competing serial Flash solutions. The Spansion FL-S delivers leading performance, automotive grade temperature ranges and in some applications, eliminates the need for DRAM. Engineers are increasingly demanding these attributes for improving the user experience and designing innovative, graphic-rich, stylish designs in next generation electronics. The product family is available from 128 Mb (megabit) to 1 Gb (gigabit). Serial Flash memory (SPI) transmits and receives data in one, two, four or eight bits per clock cycle from the same device, enabling backwards compatibility and faster speeds. 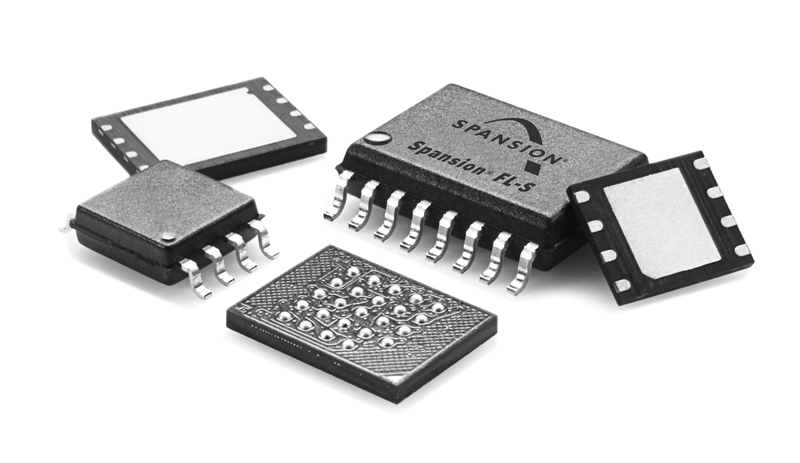 Most solutions today use one, two or four bits, whereas Spansion's FL-S products expand the bits per clock cycle to eight. Spansion's serial product portfolio is now available from 4 Mb to 1 Gb and complements Spansion's parallel NOR Flash memory family. "Serial Flash memory is estimated to grow at a CAGR of approximately 19 percent through 2015 as next generation electronics require real-time processing, advanced security, 3D graphics and smaller form factors in consumer, automotive and industrial applications," said Alan Niebel, CEO of Web-Feet Research. "Spansion is well positioned to address these application needs due to its leadership in the embedded NOR market and the high-performance of its Spansion FL-S product." "Customer demand for serial interfaces is transitioning from low density and low cost solutions to higher density offerings with more advanced performance," said Robert France, vice president of strategic and product marketing at Spansion. "With our newest Spansion FL-S product family, we deliver advanced performance and address specific application requirements, which will enable our customers to design innovative next generation electronics." The 128 and 256 Mb Spansion FL-S products are sampling now and will start production in October. The 512 Mb density will be in production in Q4 with the 1 Gb density in Q2 2012. Three times faster chip erase coupled with the three times faster programming speed dramatically improves chip re-programming time during manufacturing. This release contains forward-looking statements made pursuant to the safe harbor provisions of the Private Securities Litigation Reform Act of 1995. Investors are cautioned that these forward-looking statements involve risks and uncertainties that could cause actual results to differ materially from those statements. The risks and uncertainties include the company's ability to: create high performance and cost-effective solutions for applications in automotive, consumer, industrial and networking applications, continue to expand its technology and product development capabilities, and produce innovative and differentiated products that meet future customer demand. Additional risks and uncertainties related to the company's business are discussed in the company's Securities and Exchange Commission filings, including but not limited to the company's most recent Annual Report on Form 10-K for fiscal 2009 and Quarterly Reports on Form 10-Q. Unless otherwise required by applicable laws, the company undertakes no obligation to update or revise any forward-looking statements, whether as a result of new information, future events or otherwise. Spansion (NYSE: CODE) is a leading provider of the Flash memory technology at the heart of the world's electronics systems, powering everything from the routers that run the internet to the highly interactive and immersive consumer and automotive electronics that are enriching people's daily lives. Spansion's broad and differentiated Flash memory product portfolio, award-winning MirrorBit charge-trapping technology, and industry leading service and support are enabling customers to achieve greater efficiency and success in their target markets. For more information, visit http://www.spansion.com. Spansion®, the Spansion logo, MirrorBit®, and combinations thereof, are trademarks and registered trademarks of Spansion LLC in the United States and other countries. Other names used are for informational purposes only and may be trademarks of their respective owners.